Update: 7/21/12 - Rush's acceptance speech is now online. 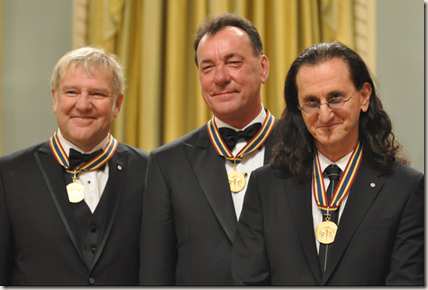 Over the weekend, all three members of Rush were in Ottawa to accept the Governor General's Award for Performing Arts: 2012 Lifetime Artistic Achievement (Popular Music). Congrats to Rush and all the other recipients! Thanks to Rushisaband and Power Windows for the head's up. Official lyrics video of "Headlong Flight"
Full version of "Tom Sawyer" from "XYZ"